Italian opera is all doom and gloom, ill-starred lovers and gruesome deaths: La traviata, La bohème, Tosca… Or is it? From 18th-century opera buffa to a late Puccini masterpiece, Italian opera also contains some of the repertory’s most light-hearted and joyous works. Few Italian composers can resist a ridiculous disguise, or the humorous music that goes with them. In Verdi’s Falstaff, Ford, as ‘Signor Fontana’ (Mr Fountain), attempts to discover if Falstaff has seduced his wife with hilariously exaggerated, through-his-teeth courtesy. Puccini’s Gianni Schicchi wittily impersonates the deceased Buoso Donati in piping nasal tones, while Norina in Donizetti’s Don Pasquale adopts the persona of the shrill spendthrift Sofronia with flamboyant coloratura. Disguise provides comic relief even in Mozart’s predominantly serious Don Giovanni and Così fan tutte, through Leporello’s impersonation of his master, and Guglielmo and Ferrando’s preposterous appearance as a pair of heavily moustached ‘Albanians’. And Rossini extracts every drop of comic potential from concealed identity, be it in Almaviva’s impersonations of an uncouth soldier and unctuous music master in Il barbiere di Siviglia (The Barber of Seville), or the chaos of Il turco in Italia’s fancy-dress ball. Then there’s the wealth of absurd misunderstandings. Nemorino and Dulcamara’s duet in L’elisir d’amore is as amusing as it is poignant, with Nemorino ecstatically hailing the quack doctor’s ‘elixir of love’ as Dulcamara chuckles at his foolishness (the elixir in fact being nothing more than a cheap bottle of Bordeaux). The comic confusion of Act III of Le nozze di Figaro – when Figaro nearly marries his mother – results in one of opera’s most remarkable musical ensembles. Romantic misunderstandings abound in Il turco in Italia, when Fiorilla’s rendezvous with Selim ends in a cat-fight after his former beloved Zaida turns up. Most absurd of all is Falstaff’s farcical Act II finale, where Ford’s frantic attempts to prove his innocent wife Alice’s infidelity end in Sir John Falstaff’s ignominious dunking in the Thames. 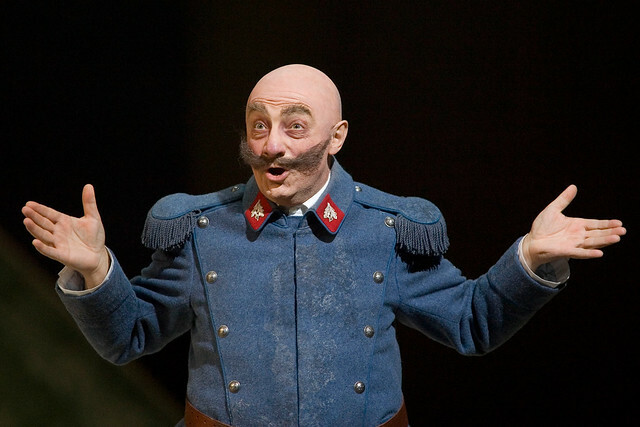 Larger-than-life male characters make a major contribution to Italian opera’s humour: indeed, the buffo bass voice type, noted for fast patter-singing, was invented for the genre. These men can amuse through their foolishness – like Il barbiere’s Doctor Bartolo with his pompous aria ‘A un dottor della mia sorte’ (For a doctor of my standing) or Donizetti’s overbearing Don Pasquale. But they can also entertain us for more positive reasons. In Don Giovanni, Leporello’s humorous pragmatism is a welcome contrast to the lofty passions of Anna, Elvira and Ottavio, while the aforementioned Dulcamara's wit and cunning never fail to delight. And while Verdi’s greedy Falstaff may have an endless proclivity for getting into silly scrapes, his zest for life and ability to laugh at himself make him perhaps opera’s most loveable rogue. And don’t forget the comic value of sheer silliness. Nemorino’s drunken conviction of the power of his elixir leads first to his feigned indifference to his sweetheart Adina and later to his farcical flirtation with an entire bevy of village girls. There’s also Falstaff’s Act III adventure in the guise of Herne the Hunter, and the chaotic music lesson in Il barbiere di Siviglia. Finally, Italian comic opera excels at tackling serious subjects with a light touch. Ford’s melodramatic monologue in Act II of Falstaff reminds us that jealousy can be as ridiculous as it is destructive – particularly when its grand climax is interrupted by Falstaff’s swaggering return in his glad-rags. And anyone who’s ever had to deal with cantankerous relatives (or, heaven forbid, an inheritance dispute) will surely relish Gianni Schicchi’s clever outwitting of the bickering Donati family. Italian opera composers may excel at tragedy – but there’s no doubt that their comic genius is equally strong. L’elisir d’amore runs 27 May–22 June 2017. Tickets are still available. The production is a co-production with Opéra National de Paris. Excellent. Both: the article and the small pieces of film. Congratulations to you all!